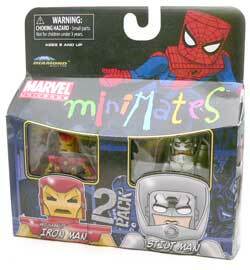 I’ll admit I bough this for the Iron Man and had no idea who Stilt Man was. Following the pattern of one figure I want and one I’m not sure about, this pack was a bit of surprise. Now that I’ve had a chance to look him up, I know Stilt Man is Wilbur Day. He follows the villain mold of scientist gone wrong. Day stole technology from the company he worked for and turned to a life of crime. His suit is a mechanical stilt suit based on some sort of hydraulic tech. He also seems to be one of those baddies that never quite ever ends up winning. I figured he was going to be a bit different but, he’s a bit cooler than what I expected in the package. The main difference is in his legs. They are made to in a cylindrical segmented form to represent his stilts. Out of the package there is a second set of cylinders on his back held on by small pegs. The cool thing is the ones on back come off and can be combined with his legs to make them really long. Since they are just cylinders, Stilt Man comes with a fairly unique accessory for a Minimate. A display base. The base plugs into the base of one of the cylinders. and lets him stand very solidly in extended mode, even on one leg. 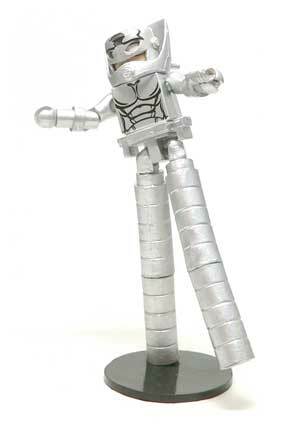 From the images I could find online, it looks like they pulled off the Stilt Man look pretty well. Other than his legs, most of his appearance comes from head. There are two pieces here for this. The first is a the high collar. This piece is fits under the head. It also has the pegs for the extra leg cylinders. The second piece is the helmet it self. It’s fairly plain with a little paint. My only complaint is it doesn’t want to stay tight down on the collar. When it pops up a bit the white of his eyes doesn’t quite line up right. Lastly, Stilt Man comes with a small gun which I’m presuming is to represent some sort of technology he invented. There have been a number of things Day has used, so use your imagination people. Okay, I’m not a big enough Iron Man fan that I can tell you what the difference between this suit of armor and the others. 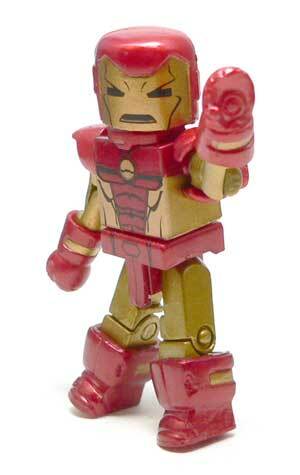 Basically, I picked him up because I wanted a fairly generic looking Iron Man for my small collection of Minimates. 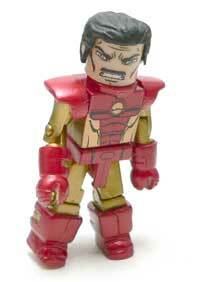 The thing I love about a number of the Iron Man Minimates is the fact they recognize it’s a man in a suit. This one is like that and the Iron Man helmet comes off to show a stressed Tony Stark face underneath. The great thing is they didn’t try to pull of some painted hair, and included a separate hair piece for the unmasked version. A pretty nifty detail is the collar piece under the head. Just a subtle little detail that helps the armored look. The overall look of this Iron Man is red and gold. And by red, I mean candy apple red. And by gold, I mean beer can metallic gold. One of the nicer aspects of this pint size Avenger is that the shoulder pads are individual pieces and not one large piece. This allows for an almost full range of motion in the shoulders. The gloves and boots are special molded pieces. Because of this, the feet don’t turn. The hands look like little oven mitts at this scale, but in a cute way. Theres a little gold detail on each of the pieces. Which is a nice detail, since they could have got by with just a red molded piece. In order for Tony to show off his repulsor technology, an extra left hand is included. This one is more open and shows the repulsor in the hand. A little paint on it would have helped, but I’m not complaining. You know I really only picked this pack up because the price was right for an Iron Man. I actually am surprised that I like it a whole lot more than I thought I would. I continue to be amazed by how such small versions of characters can have so much personality. 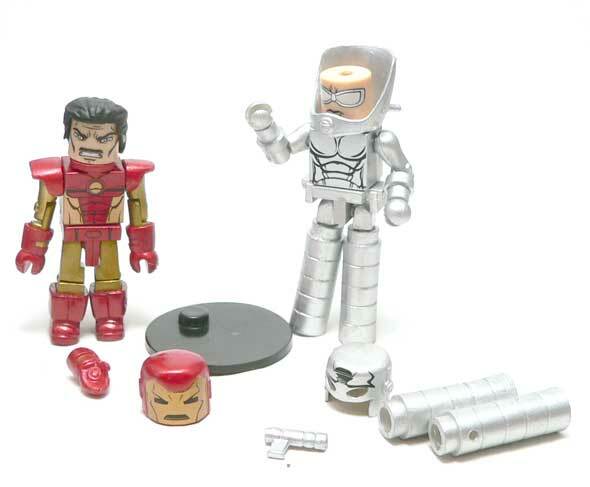 Both the extra details on Iron Man and the legs on Stilt Man make this a pretty nifty find. Stilt Man has to be the weirdest villain I’ve heard of. 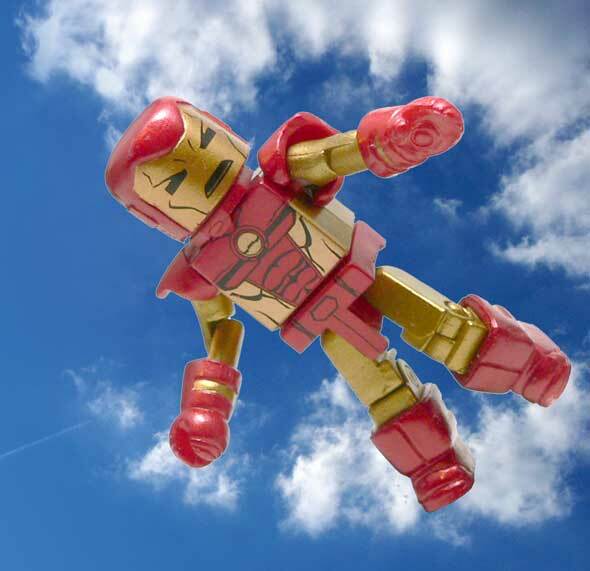 Nice looking figure but the Iron Man is clearly the main draw for the set. This probably isn’t the Iron Man I would have picked, but the price was right. And I like Stilt Man a little more every day.